The Dickies Lifestyle collection brings its famous eye for practicality to your everyday wardrobe, with well-designed pieces that bring its American heritage from Fort Worth, Texas, 1922 right into the present day. You’ll find a cracking selection of tees, shirts, trousers, jackets and many more besides. We’re talking moisture-wicking vests and easy-fit shorts that sit just below the waist, deep-pocketed jeans for carrying the necessaries and warm jackets for the colder months. In short, it’s got everything you need for your wardrobe whether you’re having a practical day taking care of what needs doing, or for when what needs doing is nothing much at all! We’re big fans of its accessories section, where you can pick up a muldoon cap or branchville belt to complement your trousers. Then there are the leather wallets for storing your hard earned cash and the rucksacks for taking your stuff with you in style. Whether you’re a hard labourer or just want to look like you are, Dickies’ lifestyle range will have something for you! How do I use my Dickies promotional voucher? 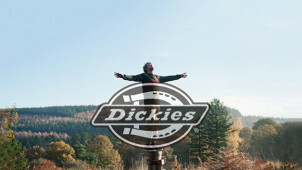 Sign up to Dickies’ mailing list to hear about some brilliant offers! Can I get Dickies free delivery? Yes, on orders over £25! Can I download a Dickies catalogue? Yes, you’ll find these online. How can I pay with Dickies? You can pay at Dickies with Visa, Mastercard, PayPal, Maestro, Giro Pay or Sofort. Complete the paperwork enclosed with your order, repackage your items, attach the returns label then drop your parcel off at the nearest Post Office. See the full policy for more details. Dickies is that celebrated American workwear brand, now with a speciality in bringing its hard wearing staples to your everyday wardrobe. Bring the reliability and sturdiness you rely on in the workplace into your everyday life with these pants, shirts and accessories, not forgetting to add a Dickies discount code from vouchercloud to take a chunk out of the price. Dress like the long-haul trucker you’ve always wanted to be with Dickies! For information on what to wear to suit your lifestyle, simply check out the Dickies blog for featured posts on what matters to you. Whether you're a hiker, enjoy outdoor pursuits, work on a farm or simply enjoy well fitted clothing — this is where the experts will advise you on the best products to suit your needs. Now you can invest wisely and make the most of your gear with Dickies. Dickies pants are at the very core of its range. Exceptionally well designed to withstand all conditions, easily release stains, wick moisture and sit well at the waist, these all-purpose trousers bring real masculine grit to your wardrobe. Shop with a Dickies promo code from vouchercloud and you’ll be sure to make a saving on your next purchase. Embrace your inner Hank from King of the Hill with a pair of your own today!